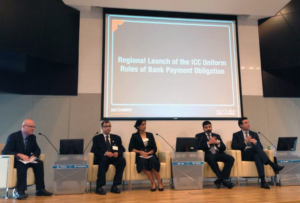 The International Chamber of Commerce’s Regional Banking Commission Middle East and North Africa (MENA) in partnership with the Dubai Chamber of Commerce and Industry today held a regional launch of the ICC Uniform Rules for Bank Payment Obligation (URBPO) at Dubai Chamber headquarters. Developed by the ICC Banking Commission in partnership with the financial messaging provider SWIFT, the URBPO are a 21st century standard in supply chain finance that will facilitate international trade. They are set to come into force on 1 July. The regional launch ceremony was attended by Hamad Buamim, Director General, Dubai Chamber, and Deputy Chair, ICC World Chambers Federation, Lakshmanan Sankaran, Chair, ICC Regional Banking Commission MENA, and Thierry Senechal, Executive Secretary, ICC Banking Commission. They were joined by chief financial officers, corporate credit and risk managers, corporate treasurers, bankers, insurers, consultants and vendors active in trade and supply chain finance. URBPO provide the benefits of a letter of credit (LC) in an automated environment and enable banks to offer flexible risk mitigation and financing services across the supply chain to their corporate customers. In his welcome address, Mr Buamim said that as a business facilitator Dubai Chamber welcomed the regional launch of the ICC URBPO which will serve the trading community and help drive growth and benefit the trade sector across the whole of MENA. Offering an alternative means of settlement in international trade and an innovative solution in supply chain finance for trade across the MENA region. Mr Buamin said that the URBPO will help advance Dubai Chamber’s strategic objective in supporting the development of business and added that the new rules will not only support the emirate’s banking sector but will also go a long way in sealing its status as the region’s leading banking and financial hub. The regional launch of URBPO was followed by a panel discussion giving the corporate perspective and relevance of the new rules and how they will impact businesses in the MENA region. The ICC Regional Banking Commission, MENA, also revealed key findings of its Global Trade finance Survey 2013, which provides a detailed statistical analysis of the regional and global trends in trade finance. The ICC Regional Banking Commission (RBC) MENA initiative was set up by Dubai Chamber to provide a better understanding of regional needs in terms of policy advocacy. It will extend the reach of ICC banking rules and related services including ICC rules and guidelines on documentary credits, UCP 600 – the most successful privately drafted rules for trade ever developed – and forthcoming Bank Payment Obligation rules on supply chain finance.